You think being evil is hard work? Try changing careers. We know that writing a resume is hard work. And writing one when you want to change careers? Even tougher. That’s why there are professional resume writing services like TopResume to help you identify your transferable skills and tell the best version of your career story to make a change. 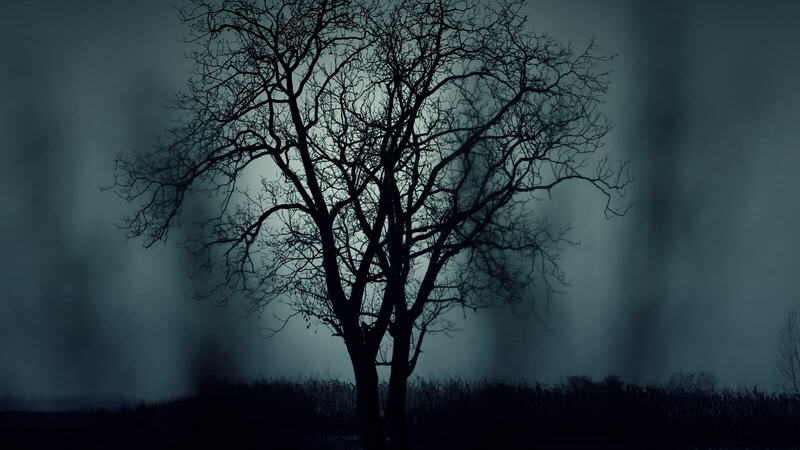 To get into the Halloween spirit, we asked a few of our TopResume writers to take on some unusual clients who were eager to put their evil pasts behind them and transition to new lines of work. 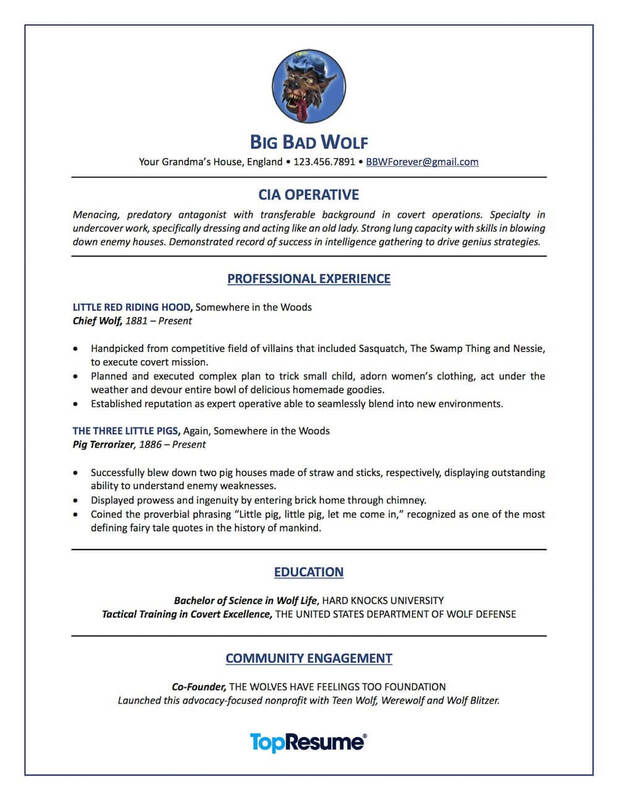 Check out their new resumes below and learn how each writer helped their wicked client craft a winning resume. If TopResume can help these villains land a new job, imagine what they can do for you! "Tom was eager to redeem himself after some failed leadership roles. He recently went back to school to get a degree in education and is seeking to move into a classroom setting. 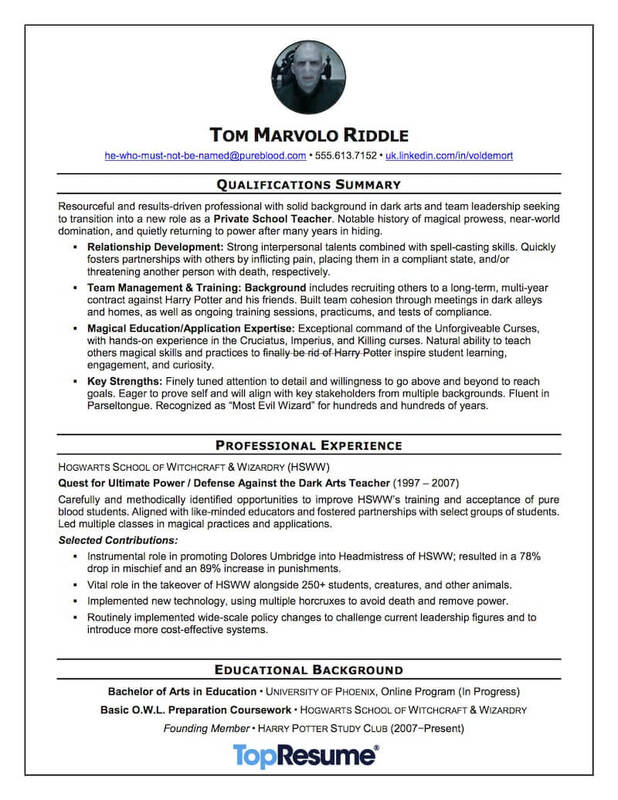 He wanted his resume to capture both his magical skill set and his potential for leadership roles in the future. 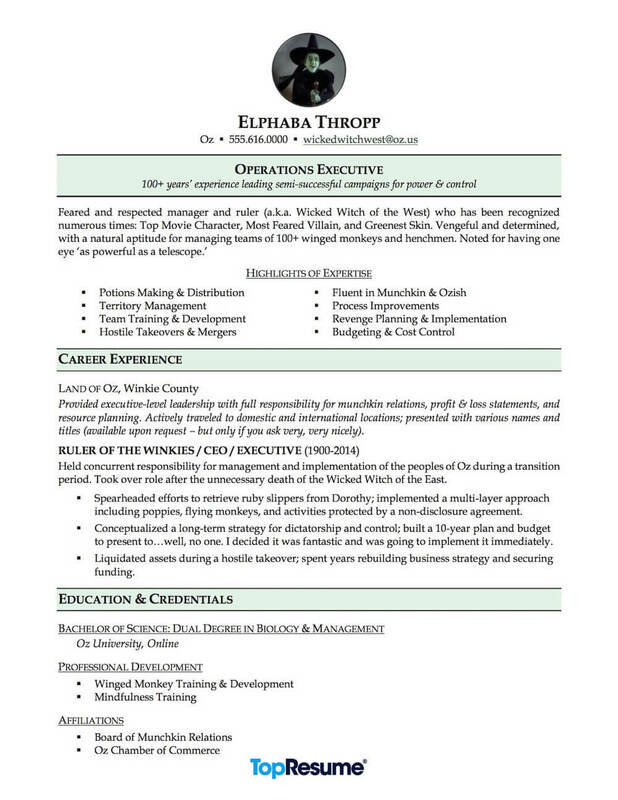 To help, I used a career change resume format to showcase his strongest abilities and how they could be leveraged in a new role." 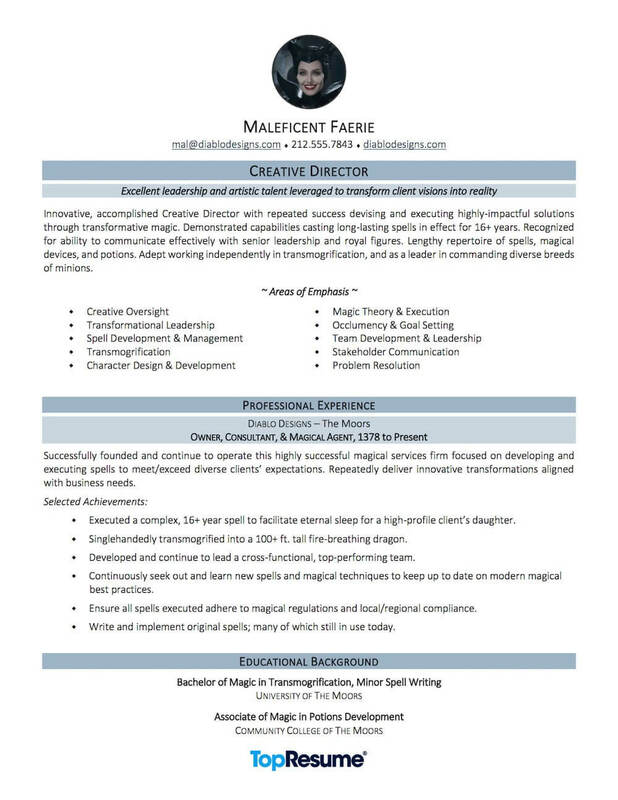 "Ms. Faerie came to us from a purely consultant/freelance background and wanted a new resume to position herself for a creative role in the corporate world. She brought with her an exceptional background in successfully executed spells and various other quantifiable achievements. It was simply a matter of fine-tuning her accomplishments in a way that popped for the roles she was seeking." "Miss Thropp came to me after a short period of recuperation from a water-related injury. She is most interested in positions of leadership and wanted to clearly point out that she had numerous experiences working with diverse groups while simultaneously implementing multi-layer strategies of revenge. 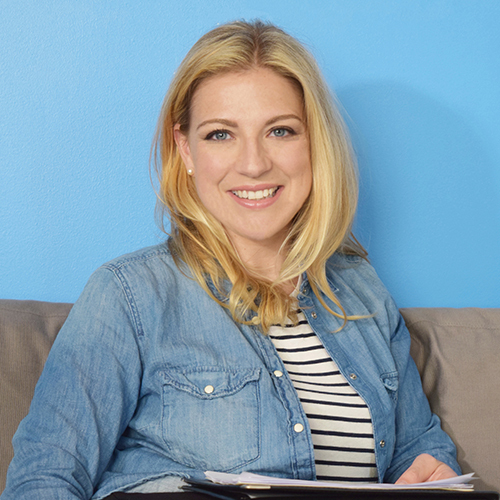 Her ability to remain calm during hostile takeovers by young girls was something that she wanted to emphasize, as it's a valued skill in the business world." "The Big Bad Wolf stopped by my office looking for a change — and to ask if I had seen any little piggies. Upon chatting, we discovered that he was sick and tired of playing the role of villain. He expressed a desire to change his career focus and put his transferable skills to good use. We worked together to identify which of his talents would make him marketable for a position as a CIA Operative; skills like dressing up for secret missions and gathering evidence for evil plots were the standouts." *Please note: We took some creative license with these resume makeovers. We do not recommend adding a profile picture to your resume and do use extreme caution when deciding to incorporate color into your resume’s design. Click on the following link for more advice on changing careers. Hire a TopResume professional writer to prepare your resume for a career transition.